Jill Rose of the US Department of Justice and Resident Legal Advisor at the US Embassy in Kuwait. 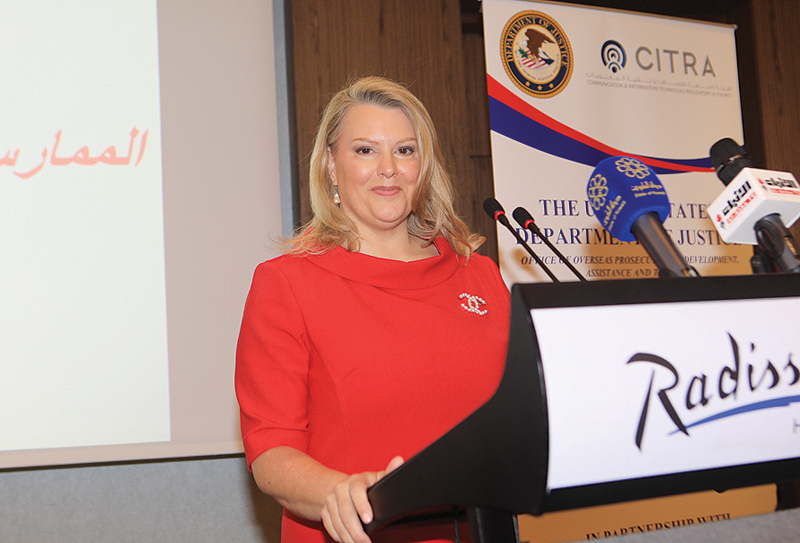 KUWAIT: Cybercrime is a rising threat – with a stroke of a fingertip, a criminal can wreak havoc for businesses, people and governments around the world, said Jill Rose of the US Department of Justice and Resident Legal Advisor at the US Embassy in Kuwait. She was speaking during a seminar entitled ‘Best Practices in Cyber Investigations’ organized by the Communication and Information Technology Regulatory Authority (CITRA) yesterday. “They are sophisticated, so we must be equally sophisticated to keep out intrusions and bring them under the fold of the law to stop them from destroying our norms,” she said. Rose pointed out that it is of great importance for GCC countries to come together regionally to begin coordinating to share information and expertise to address the issue. The seminar also aims to encourage them to join the G7 24/7 Network. “The G7 24/7 Network is an international cooperative network of over 80 countries that assist one another in the investigation of crimes committed over the Internet or through digital means. Through the 24-7 Network, member countries assist one another, preserve electronic evidence across borders and respond to other urgent requests. It is incredibly helpful in sharing information internationally, secure evidence and quickly respond to hackers,” Rose added. The US Embassy’s Deputy Head of Mission Larry Memmott. In his opening remarks, the US Embassy’s Deputy Head of Mission Larry Memmott noted the cyber world consistently creates investigative challenges, both by virtue of its rapid evolution and because it is an expansive field in which bad actors can operate. “Social media platforms provide unprecedented opportunities for the free exchange of ideas. This is a good thing, but many users do not realize that these same platforms allow malicious actors to deceive them by launching vast influence operations,” he said. “Your role is critical because malicious use of technology cannot be deterred without clear consequences. There must be a credible system in place with the capacity to impose punishment for committing fraud, hacking into information systems, stealing data and disabling computer systems,” Memmott added. He said it is yet impossible to employ criminal enforcement tools without first identifying the perpetrators – whether they are ordinary criminals, transnational organized criminal organizations, or hostile nation-state officers. “There are no borders in cyberspace. This poses challenges for police and for prosecutors investigating incidents of cybercrime which involve suspects, victims and crimes spanning multiple countries. This workshop provides an opportunity for your colleagues from the US to share their experiences with these challenges and provide some insight into overcoming the impediments of complex cyber investigations,” he said. Memmott suggested to defeat malicious actors, all sectors must collaborate. “We must share information. And pertinent to this gathering, we must educate ourselves to be better equipped to address the national security threats posed to each of our countries by these criminal elements. It is my sincere hope that this seminar will enhance your capabilities and open a continuing dialogue between you and your American colleagues. It is critical that you remain in touch with us after this seminar to continue the mutual learning process and to coordinate on best practices,” he added. 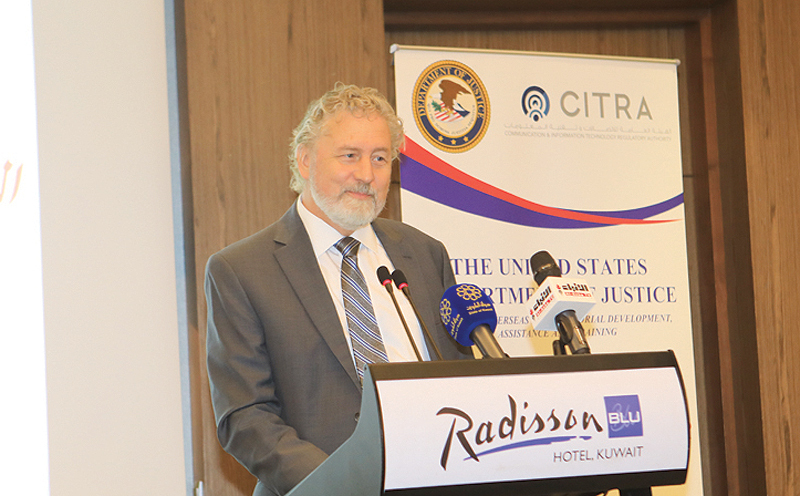 Vice Chairman of CITRA Khaled Al-Kandari also welcomed participants at the cybercrime seminar.